If you were to look up the word “perseverance” in my personal life dictionary, you would find a photo of the quilt I finished this week. 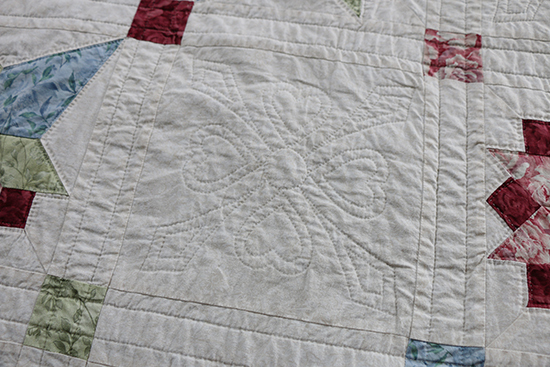 This post is a little longer than usual because making this quilt has likewise been a long journey. And yet, as I reread what I've written I know that there are so many more details than what you see here. As near as I can remember, I think I started this quilt in 1999. 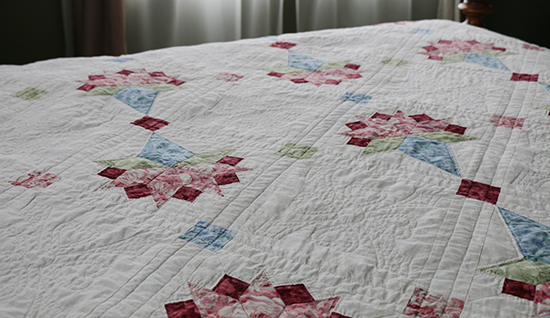 I was still relatively new to quilting; I don’t believe I had made more than five quilts by that time. I don’t recall whether I was drawn in first by the pattern or the fabric, but somehow I settled on the Bride’s Bouquet block featuring floral fabrics. For those of you who are unfamiliar with the Bride’s Bouquet block, there are a lot of Y-seams with set-in corners. As a beginner, I didn’t realize what I was getting myself into; the fussiness of Y-seams can make experienced quilters squirm. In addition, the center of each block has seven seams that need to come to a single point — that’s a lot of bulk to manage and align. The more I looked at the quilt, the more I thought it needed to be hand quilted. With a couple years already invested in the quilt top, what were a few more years to take my time with the quilting? I found a template that I thought filled the plain blocks nicely and coordinated well with the shapes in the Bride’s Bouquet blocks, and I was off! 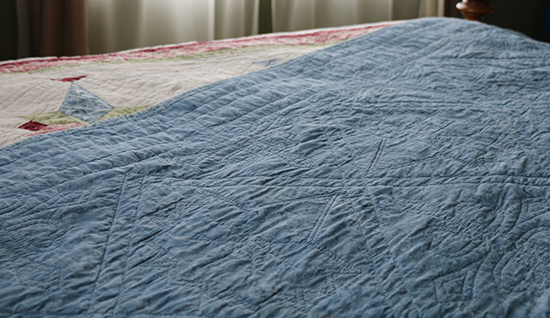 A queen size quilt is, of course, too bulky to bring along on road trips and such. Making the fine stitches requires good lighting and eyes that aren’t already tired from a long day. Even with a thimble, there are little finger pricks and pokes. Summer weather and a quilt across the lap aren’t a comfortable combination. Add small children to the mix, and it’s not a project that can be left out to work on a little here and there as time allows. Suffice it to say, I did not work on the quilt consistently for many years. Then I started going to Quilt Night. I’ve mentioned this group before. We get together once or twice a month and work on whatever projects we wish. For years, as everyone else moved from one project to the next, I brought this quilt with me every month. It was a bit of a joke to see what I was working on, but at the same time the other quilters were inspired to pull out their own UFOs — if I could work on a quilt that was by this time over ten years in the making, they could work on something they set aside 18 months ago. 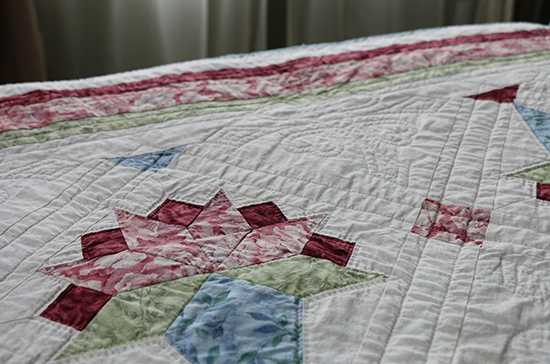 At times it seemed like the hand quilting would never end … and then suddenly, finally, it did. I finished the hand quilting about a month ago, and have been slowly hand stitching the binding in place. This week, the binding was complete. My first order of business, even before stitching my name and the date into the quilt, was to wash it. Twice. 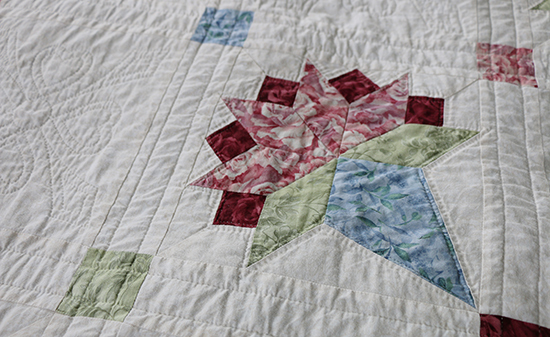 My piecing and quilting skills have improved over the years, as one would hope they would with almost twenty years of practice. Yes, there are some areas of this quilt that make me cringe a little when I look at them because I know so much more about what to do and not do, but every mistake on that quilt was part of a greater journey that brought me to the skill level I have today. I could probably pick out the first and last bouquet blocks I sewed if I tried — but I would rather enjoy the quilt as a whole. The whole is, truly, greater than the sum of its parts. It’s been about 18 years since I started this quilt, and now we get to sleep under it every night. 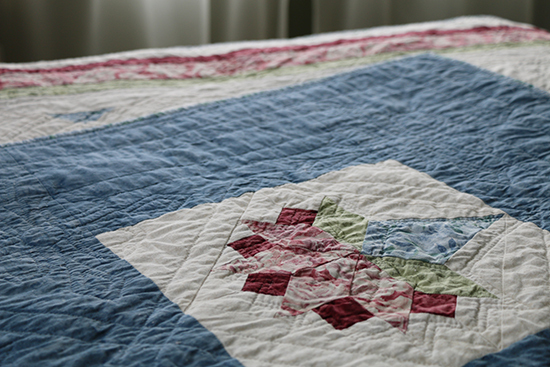 The time and memories that went into the quilt somehow make it feel even warmer. Wow! That is beautiful. I also have an "18 year" quilt but it isn't anything like as nice as yours. Really lovely.